Ford will continue using late-night TV to generate buzz that a 30-second spot can't offer. The automaker used a skit on ABC's "Jimmy Kimmel Live!" 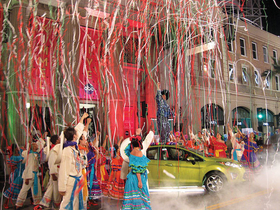 to celebrate Cinco de Mayo and promote the new 2011 Ford Fiesta. After slashing TV advertising spending during a disastrous 2009, automakers are putting more money into TV again and changing the shape of the annual upfront TV buying season in the process. As sales increase, "This is the make-or-break-it year for a lot of automakers as they try to set their trajectory for where their share is going to be for the next couple of years," said Fred Sattler, managing director of Initiative+, the U.S. media-buying agency for Hyundai and Kia. The increase in TV advertising began late in the fourth quarter of 2009, when automakers started spending more on year-end sales campaigns. That trend continued in the first quarter as auto spending jumped more than 60 percent from year-ago levels on local TV. At the same time, cable increased 20 percent and broadcast network spending grew 14 percent, reported Kantar Media, a global data and consulting firm that tracks TV spending. But the biggest change is in the upfront market, where advertisers historically make initial purchases of TV advertising for fall programs. After single-digit percentage price increases last year, the four major broadcast networks expect increases of 20 percent this year, auto and TV executives said. Drew Slaven, general manager of marketing services for Mercedes-Benz USA, said he expects network prices to be up significantly. Mercedes plans to remain aggressive in national broadcast TV as long as pricing doesn't become "irrational," Slaven said. Mercedes returned to TV last year with a big push into the broadcast market, primarily for key product launches. This year Mercedes will align its brand with what Slaven called "premier programming," such as national sporting events or the Fox medical drama "House." Mercedes isn't alone in its plan to increase spending on TV. Judy Wheeler, director of marketing delivery for Chrysler Group, said the company will spend more this year in the upfront market as the automaker tries to rebuild buyer consideration. Chrysler boosted first-quarter spot TV buys by 77 percent compared with 2009, when the automaker was immersed in pre-bankruptcy issues, Kantar Media reported. Chrysler did not disclose the amount of its spending. "I can safely say we are in a much better position this year than we would have been last year," Wheeler said. "Advertising is important to us to establish our brands and to establish that we are a healthy company." Chrysler has changed its media strategy. Instead of making one broad buy and then divvying ad slots among its brands, the automaker will use network TV to deliver separate and specific messages for the Dodge, Jeep, Chrysler and Ram brands, Wheeler said. For example, Jeep may appear on more adventure-related shows, while the Chrysler brand will be tied to more high-end, high-profile programming, such as the Golden Globe and Academy Award broadcasts. Ram has been linked with country music, as shown by the new truck brand's recent integrated deal with CBS and the Academy of Country Music's annual awards last month. That deal included a Ram-sponsored text-to-vote program for Entertainer of the Year, links to Ram's Web site and an on-site vehicle display at the event. Wheeler said football will continue to be important, especially for Dodge, Jeep and Ram. Dodge was a Super Bowl advertiser this year with a spot for the Charger from agency Wieden + Kennedy, and Chrysler is expected to return to football advertising in the fall. Broadcast network TV will continue to play a key role in General Motors Co.'s marketing mix because of its reach, said Paul Edwards, executive director of GM's marketing and support group. He said the medium plays a different role for each of its four vehicle brands depending on the specific target audience. U.S. automaker and dealer TV ad spending, in millions. Integration will be crucial to Ford Motor Co.'s network plans, said Matt VanDyke, Ford's marketing director. Ford will work to complete deals across its media properties. As consumers spend more time online, Ford will increase its presence in 15- and 30-second online clips such as the TV and movie content site Hulu.com. "In many cases, content lives on TV and online, so we look to buy in integrated places," VanDyke said. Ford is "absolutely pushing our broadcast partners to bring us more meaningful integrations" in 2010, he said. Ford will continue to work with late-night network and cable TV programs to produce unique content, such as the recently completed deal with ABC that resulted in skits with Ford vehicles on "Jimmy Kimmel Live." Those skits, which highlighted the 2011 Fiesta small car, generated buzz that goes beyond a 30-second commercial, Van-Dyke said. Ford managed to find values in last year's upfront market. "We don't expect to see the same protracted market, but we're still looking for value," VanDyke said. But Ford isn't just looking to buy ad slots at a low cost. "We want to improve engagement" with consumers, said VanDyke. Ford will buy a balance of broadcast and cable network TV this year. "We will be back to a typical upfront and take advantage of limited opportunities in a competitive marketplace," VanDyke said. Despite the hype about advertisers moving online, Slaven of Mercedes said, "Broadcast network television continues to be the 800-pound gorilla."